BEIRUT — Syrian opposition activists have released haunting pictures of a young boy rescued from the rubble in the aftermath of a devastating airstrike in Aleppo. The image of the stunned and weary-looking boy, sitting in an orange chair inside an ambulance covered in dust and with blood on his face, encapsulates the horrors inflicted on the war-ravaged northern city and is being widely shared on social media. A doctor in Aleppo on Thursday identified the boy as Omran Daqneesh, aged 5. Osama Abu al-Ezz confirmed he was brought to the hospital Wednesday night following an airstrike on the rebel-held district of Qaterji with head wounds — but no brain injury — and was later discharged. Rescue workers and journalists arrived at Qaterji shortly after the strike and began pulling victims from the rubble. "We were passing them from one balcony to the other," said photojournalist Mahmoud Raslan, who took the photo. He said he had passed along three lifeless bodies before receiving the wounded boy. A doctor later at the hospital, which is also known as "M10," later reported eight dead including five children. The strike occurred during the sunset call to prayer, around 7:20 p.m, said Raslan, a correspondent for Al Jazeera Mubashir. Omran was rescued along with his three siblings — aged 1, 6, and 11 — and his mother and father from the rubble of their partially-destroyed apartment building, according to Raslan. The building collapsed shortly afterward. "We sent the younger children immediately to the ambulance, but the 11-year-old girl waited for her mother to be rescued. Her ankle was pinned beneath the rubble," Raslan added. In a video posted late Wednesday by the Aleppo Media Center, a man is seen plucking the boy away from a chaotic nighttime scene and carrying him inside the ambulance, looking dazed and flat-eyed. The boy then runs his hand over his blood-covered face, looks at his hands and wipes them on the ambulance chair. Doctors in Aleppo use code names for hospitals, which they say have been systematically targeted by government airstrikes. Abu al-Ezz said they do that "because we are afraid security forces will infiltrate their medical network and target ambulances as they transfer patients from one hospital to another." 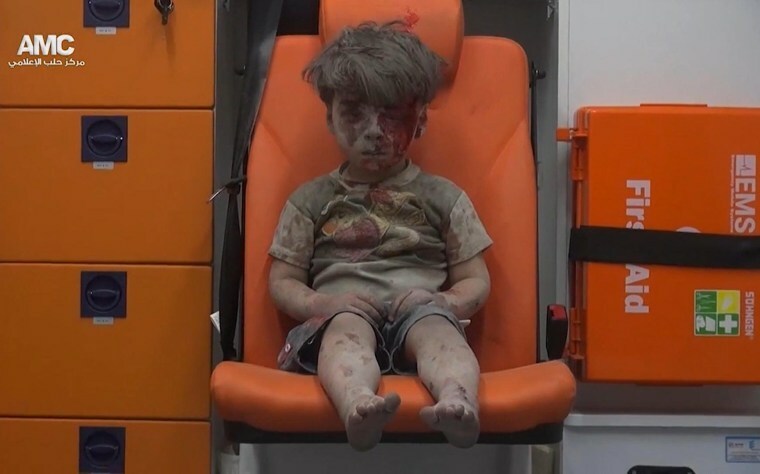 The horror generated by the image of Omran in the ambulance echoes the anguished global response to pictures of Aylan Kurdi, the drowned Syrian boy whose body was found on a beach in Turkey, which came to encapsulate the tragedy of Syria's civil war. It also comes against the backdrop of a U.N. call for weekly 48-hour cease-fires to allow humanitarian aid deliveries to the embattled city of Aleppo. Russia said Thursday it was ready to back the initiative — on condition that the aid convoys should travel to both rebel-controlled and government-controlled parts of the city. Frustrated because aid convoys to besieged cities like Aleppo have been impeded this month, the U.N. envoy for Syria cut short a humanitarian task-force meeting Thursday after just eight minutes in hopes of ratcheting up pressure for a cease-fire. "Not one single convoy in one month has reached any of the humanitarian besieged areas — not one single convoy," de Mistura, who chairs the task force, told reporters. "And why? Because of one thing: Fighting." His office later clarified that some U.N. convoys had been able to reach "hard-to-reach" or other priority areas in July but none so far during the month of August.